Conrad Business Supplies stocks the FLIR ONE that converts an iPhone into an advanced thermal imaging camera. Conrad Business Supplies has begun stocking FLIR System, Inc’s latest thermal imaging product to be released in Europe. The FLIR ONE offers the company’s market leading expertise in thermography and thermal imaging cameras that enhance perception and awareness in a pocket-sized format. 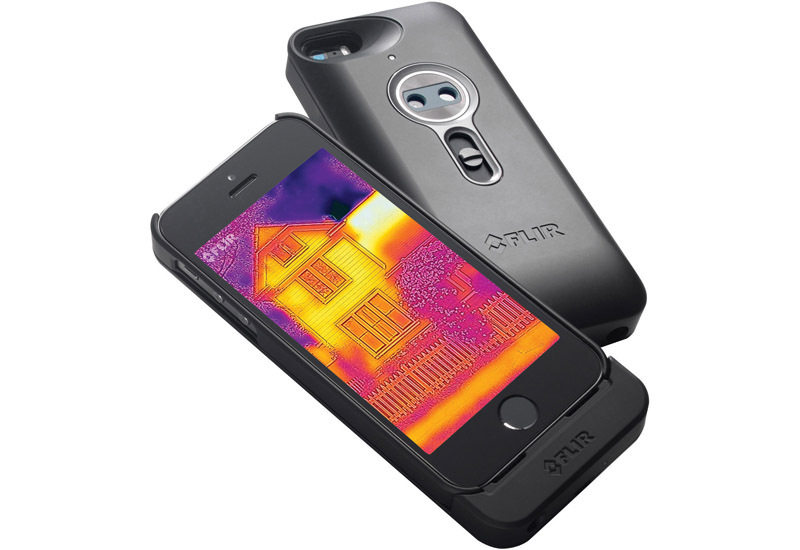 Utilising a slim case which conveniently attaches to an iPhone 5 or 5s, FLIR ONE provides a compact and easy method for turning a smartphone into a powerful thermal infrared camera, giving the ability to “see” and measure minute temperature variances on the phone’s screen. Fitted with two cameras, including a long-wave infrared Lepton sensor, the FLIR ONE uses MSX Technology to provide unprecedented thermal imaging capability and sharpness by blending the thermal and visible spectrum. This technology allows the FLIR ONE to detect temperature differences as small as 0.1 °C across a range of 0°C to 100°C. With a dedicated battery, providing four hours of continuous use, the FLIR ONE does not place any additional power demands on the iPhone and it can be charged via a micro USB port. Once captured, images can be easily shared or distributed using the phone’s standard connectivity and the FLIR ONE app. From helping to locate piping hidden behind walls or floors, to checking over the coolant and exhaust systems on a car, or even detecting wild animals and intruders in the dark, the FLIR ONE complements the existing range of almost 60 FLIR thermal imaging and measurement products offered by Conrad. Thomas Pilhofer, Product Manager, Category Business Supplies at Conrad commented: “Maintaining our longstanding relationship with FLIR we are delighted that Conrad is one of the first to stock this highly original and innovative product, which provides users with the ability to convert their smartphone into a thermal imaging camera, ideal for work or play, at a moment’s notice”. “The FLIR ONE will be stocked alongside our existing broad range of FLIR thermal imaging products and accessories which meet the many needs and requirements of our diverse client base”.